Hello tifosis. We are testing again and as you can guess I am as happy as a child who likes school and is going back to school for his first and most favourite lesson of the week many times repeated. Even if my first lap out of the pits is ending up backwards in the barriers, this is fun. Yes believe me, this is quite correct. I love testing because it gives me chances to change things and go adjusting others. It so much also reminds me of my childhood at the kart track in Kerpen where I would spend so many happy hours alone working with the kart. Some people with psyschiatrist feelings are saying that there is something deep in this and perhaps too much time alone with just machinery for friends has put my development under arrest, but that is probably only because they are paid to say something and this is the most interesting thing they can come up with. That kart is in the Schumacher museum now, so it is simply not true that I have to polish it every day. The idea of sending it a card on its birthday was just a little joke and nothing should be read from it. Many people are asking me now my reactions to the changes that have been introduced by Max Mosley. I honestly think he is making some good choices about the future of our sport. In between watching WWF Celebrity Smackdown and Mensch Und Motors I switched accidentally onto a history programme one night. It showed that his father was Sir Oswald Mosley a man who wanted to become a facist dictator. Luckily for all of us in F1 Max is so different from his father. I feel sad for our electronics engineers who have worked so hard on the traction control at Maranello but I am supposed that it is the same for everyone, so that is fair. It is very tough on Peter Sauber who has just spent $2 million on a two-way telemetry project. Now he has to go and throw it into the dustbin. No wonder he smokes so much. Why? Because they have such short names. They should try the cramped hands that a 'Schumacher' gives them! I walked into her office to search for some of the new pens. In the corner there was a big pile of magazines. On top of it was a handwritten note in Italian. 'Villeneuve cr*p, don't show to Michael'. As you can estimate, I am sitting straight down and reading them all. Except the ones in French and Spanish obviously. But all of the ones have interviews with Villeneuve in which he is dragging up the past, Jerez, critically speaking of me and Ferrari and the HANS system, which he knows I am approval of. It is silently making me very angry. He is also trying to wage war with his new team-mate, Jenson Button and distinctly I know the reason for this. Jenson is a great guy. When he came into F1 he admitted to press conferences that he was a big fan of mine and it was touching me that he had a poster of me on his bedroom wall when he was younger. He did not have a poster of Jacques. Unless you count one of Snow White and The Seven Dwarves, where Jacques is Grumpy dwarf. For so long I am fed up with this constant anti-Schumi attitude. Other drivers, with perhaps the exception of Damon Hill, I can get along with. I had harsh words with Juan-Pablo and we made it right between us. If I allow myself some credit, I think I am good at repairing relations. But with Villeneuve there is no arguing. I am the devil and in his eyes this cannot be changed. 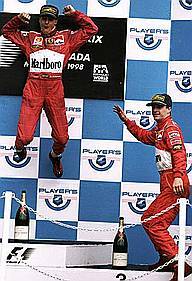 I was very saddened to hear Eddie Irvine won't be racing in F1 any more. With him I am having great fun over the years. Our Ferrari time together was the best. I can remember him making me laugh so many times to the point I was often rolling on the floor with tears flooding out of my eyes. I have had some impressive No.2s in my time. Rubens I get along with, Joss is a good friend and Martin Brundle also, but Eddie was the best No.2. you could ever wish to have sitting in the other car. Finally some German humour (as part of my project for 2003). Why did the Mexican push his wife off a cliff? It is the way I am telling them. Disclaimer: I am not the author, but have archived these entries for posterity as I felt that they were so well written by "Michael Schumacher" for Planet-F1 (who have removed almost all of the originals from their website).